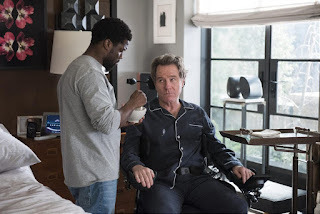 An amiable buddy comedy with a few dramatic moments, The Upside explores an unlikely friendship between a depressed tycoon and a scrappy ex-convict. In New York City, wealthy businessman and successful author Phillip Lacasse (Bryan Cranston) is now a dour quadriplegic, looking to hire a new full-time live-in caregiver while still grieving the loss of his wife. Dell Scott (Kevin Hart) is on parole, unable to make support payments to his ex-wife Latrice (Aja Naomi King) and desperate to collect signatures to prove to his parole officer that he is looking for work. Phil is intrigued by Dell's genuineness and hires him, shocking his prim business manager Yvonne Pendleton (Nicole Kidman). Dell uses his street smarts to adapt to his new job, although Yvonne remains cold and tracks his every misstep to justify a termination. Dell and Phil begin to establish a friendship, with Phil encouraging Dell to think of new business opportunities and Dell helping his new boss enjoy life to the fullest extent possible. But when Dell pushes Phil to advance a burgeoning romance past the letter writing stage, the outcome is unexpected. A Hollywood remake of the 2011 French hit The Intouchables, The Upside languished in limbo for about 18 months after the Weinstein Company's demise. Directed by Neil Burger with a script by Jon Hartmere, the film is a middle-of-the-road, feel-good story inspired by real events. Containing neither sharp edges nor blatant missteps, this is decent entertainment delivered in a polished package with good performances. Phil and Dell come from different worlds and have plenty to learn from each other. They both dare to try something completely different, providing the story with robust impetus. Through the respect and warmth that evolves between the two men The Upside tackles themes of responsibility, accountability, grief and second chances. The film is strengthened by Dell's robust back story, where his strained relationship with Latrice is creating a deep chasm with his young son, and his criminal past still casts a long shadow on the present. For all the good intentions on display, Hartmere and Burger cannot escape plenty of contrived set-ups to generate the requisite choppy moments. In his first visit to Phil's lavish apartment Dell acts on old instincts and helps himself to an item that becomes the MacGuffin for plenty of conflicts. And the meltdowns that both men have at crucial moments are more dictated by script requirements than any credible circumstances. Most of the film's energy and laughs arrive courtesy of Kevin Hart, who easily fulfills comedy duties but also stretches towards admirable moments of drama, anger, frustration and poignancy. Confined to only moving from the neck upwards, Bryan Cranston conveys the resentment of a man angry at still being alive, initially most preoccupied with ensuring those around him understand his do-not-resuscitate instructions. Nicole Kidman is note-perfect as the tense and calculating Yvonne, a woman with an icy exterior bottling up all sorts of emotions. The Upside delivers its simple message of hope for a better future no matter what how dire present circumstances are. It's largely conventional, but also innocuous.